SOLO’s Advanced Wilderness First Aid certification (AWFA) course provides in-depth information on medical and environmental emergencies alongside hands-on practice of backcountry first aid skills. Students learn both in the classroom and in the mountains, trails, and streams at NOC’s Nantahala River campus. 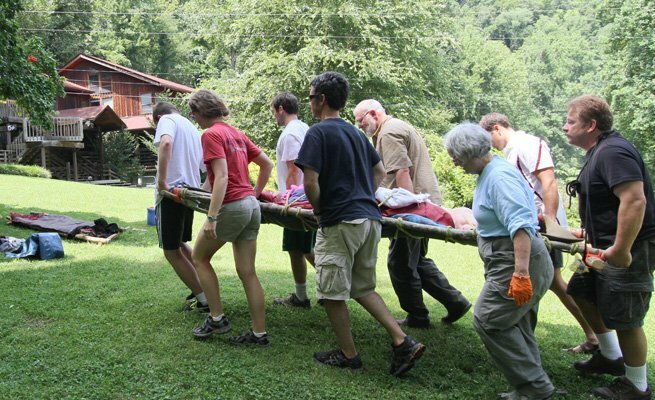 With an emphasis on leadership, students learn to confidently take control of medical situations.This course is designed for people who currently hold a Wilderness First Aid certification and want to upgrade to an Advanced Wilderness First Aid certification. The WFA-AWFA bridge course curriculum goes into greater depth of the basic first aid subjects while emphasizing leadership skills. AWFA presents new skills such as litter packaging and traction splinting. This course is divided between classroom-based learning and practical skills, case studies, and scenarios designed to challenge your decision-making abilities.